DID YOU KNOW…ALL jobs have potential safety hazards? That’s right – EVERY job!! The best way to stay safe is to ask lots of questions. As many people wrap up the school year and start applying for summer jobs, they should remember to look into employment and safety rules that apply to young workers. 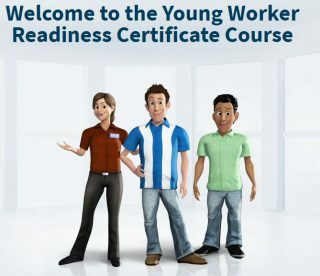 Most importantly, 14 and 15-year-old workers need to have their Young Worker Readiness Certificate Certificate of Completion before they can enter the workforce. If you’re older than that … it’s still a good idea and looks great on a résumé! Click here to find out more. DID YOU KNOW … as a worker you have three rights? Can I refuse to clean the bathroom because it’s disgusting? No – you cannot refuse work that you don’t want to do. Can I refuse to clean the bathroom because I’ve never cleaned a bathroom before? Yes – you can refuse work you haven’t been shown how to do. Once you have been shown how to clean the bathroom safely and properly, you cannot refuse. Can they fire me if I refuse? No – your supervisor or boss must take the time to show you how to do the job safely. If the job can’t be done safely, they must find a different way to do it. DID YOU KNOW … as a worker, you also have responsibilities? Stop and ask if you don’t know how to do the job safely or properly. Is health and safety included in your orientation? How many injuries happened here last year? If they answer this openly – that’s a positive sign. If they try to avoid – it’s probably not a good place to work. What are the dangers of my job? Who will be training me? Who will be training me in job safety? Is there any safety gear I will be expected to wear? Who will train me in how to use it? What are my health and safety responsibilities? Who do I ask if I have a health and safety question? What are the emergency procedures and where is the emergency equipment? What do I do if I or a co-worker gets hurt? First Aid? WCB? These questions are taken from the Alberta Workers’ Health Centre. “Safety’s got nothing to do with me…has it?” – Your brain is immature! Check out this page to find out how this may affect your ability to work safely. Safe Workers of Tomorrow (Manitoba) – Resources including a printable booklet and quiz. See if you know how to work safe! Canadian Centre for OH&S – Safety information, tips to help you find a job, and special information about volunteering. WorkSafe Saskatchewan – How to stay safe on the job, including your rights and responsibilities. WorkSafe BC – Videos and other guides to help you work safe. Queensland Government (Australia) – includes a Choose Your Own Adventure story! In the end, this is about protecting our kids, and our future.